The Last Leaf Gardener: UPDATE on my "rescue tree." I checked my initial photos of this tree (some of them are featured in the aforementioned posts), and, sure enough, the bottom right portion of the tree was gone all along, which is probably why someone abandoned it. And to think I only noticed it yesterday! Perhaps this is because it was the first snowfall that's occurred since I had the tree, and the snow drew attention to the missing branches. Be that as it may, I'm very grateful that I have this sweet tree, and, it seems the wild birds who visit my place are also glad the "rescue tree" is here, as evidenced by the house sparrows as well as the house finches (both of these bird types can also be seen in the first two images of this posting). 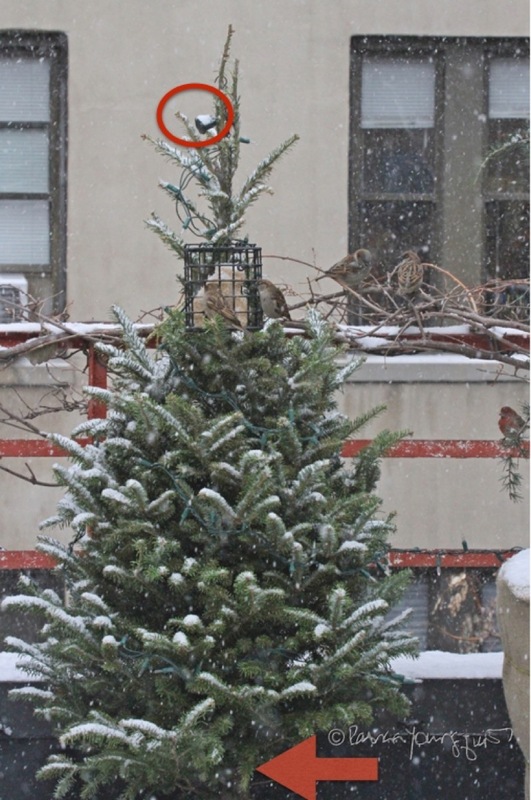 After all, it's a well known fact that "Christmas trees provide the birds with excellent shelter from winter winds and wily predators," but the bottom branches play an important role in this. But at least my tree has bottom branches on his/her left side. 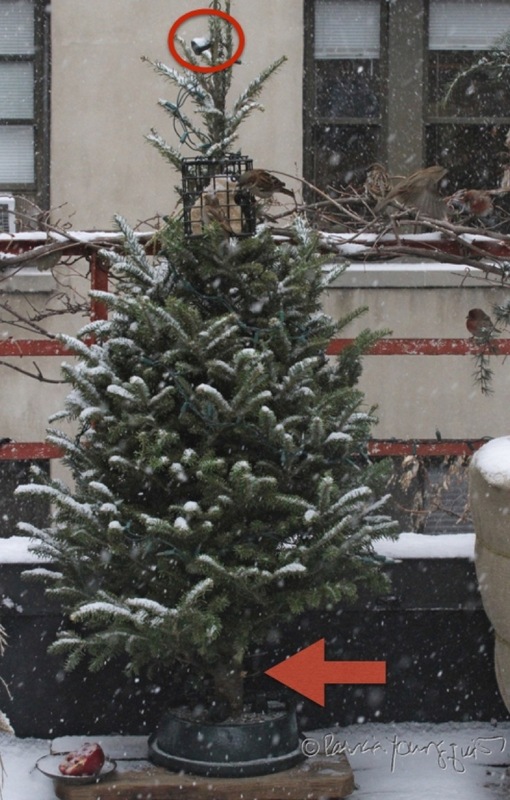 We've had record breaking cold temperatures here in the city, therefore, I haven't been able to get the help I need to give this tree a star, and it's now the seventh day of Christmas! An empty plug (indicated by a circle affixed to the image) is ready to accommodate the lights of my tree-topper star is waiting patiently to be of service. 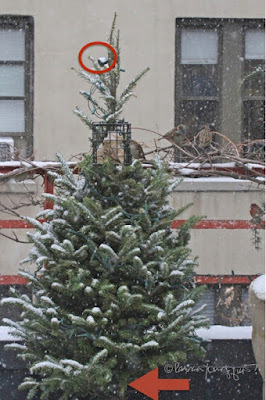 Moreover, as of now, I've only been able to hang one suet cage (bird feeder) on my tree, I need help to secure the other suet feeders, but, hey it's only the seventh day of Christmas!